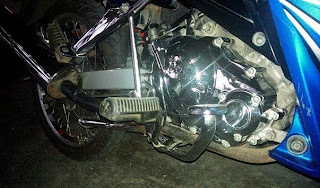 Satria or raider 150 exhaust muffler is one muffler that is often to apllying almost every motorcycle. I think the suzuki satria exhaust voice is good, suzuki satria exhaust can often be an option in boosting motor display. If you do not know how to install exhaust Suzuki Satria F / FU in the motor, Syaifudin-arena will review how to install satria f or fu exhaust in different motor cycle. The Bike that I use this time was Yamaha Jupiter Mx. 1. First, prepare silincer satria fu or raider exhaust. In indonesia satria fu silincer price about 250 thousand rupiah or about 25 US dollar and satria f silincer price ranges from 210 thousands rupiah or 21 US dollar. 2. you also prepare packing satria exhaust and 3 screws to attach the neck exhaust to exhaust silincer. 3. To make the neck muffler, you can ask to exhaust builders to make it. try exhaust neck diameter is larger than the standard exhaust jupiter mx let the traction motors more better. You can use the neck with iron materials or use stanless stell. 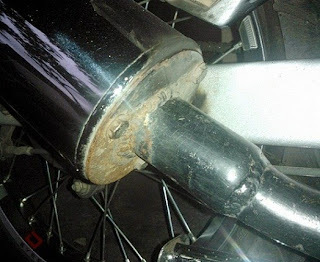 the cost of making the neck muffler with iron materials about 75 thousand rupiah or 7,5 US dollar and neck exhaust with stanless stell material about 400 thousand or 40 US dollar in indonesia. 4. 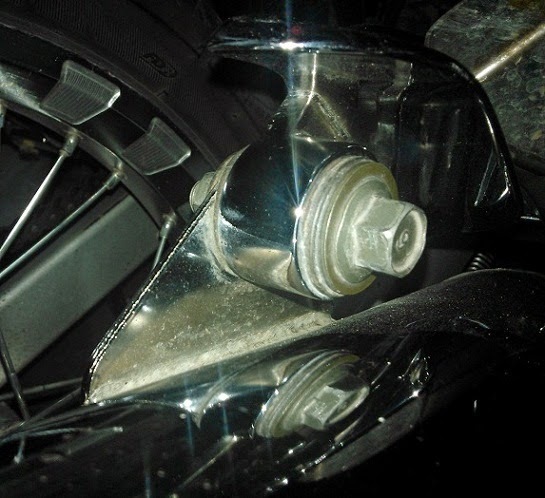 Then ,connect the silincer and exhaust neck with bolts and do not forget to enter packing exhaust. 5. And then installation process. plug the exhaust to the motor cycle, but first you require to adjusment exhaust screw holes in the rear footstep motor ,you can drill that hole let fitted with holes footstep. 6. Then check the exhaust leaks. Don’t let the air coming out from the packing. check the connection part and exhaust neck were sticking machined. 7. And the last, set carburetor motors. I think when i use satria or raider exhaus that bike look more cool because the exhaust color is chrome and impressed minimalist shape. for performance, i think more powerfull than using jupiter mx standart muffler, you should using large diameter of the neck exhaust and settings your motorcycle carburetor to have maximum performance. 0 Response to "How To Install Raider/Satria Exhaust to Yamaha Jupiter Mx"